Great value deal with ongoing classes – join anytime and save! Join anytime! The Level 1 course is continuous throughout the week with 4 classes running each week for the 5 weeks. 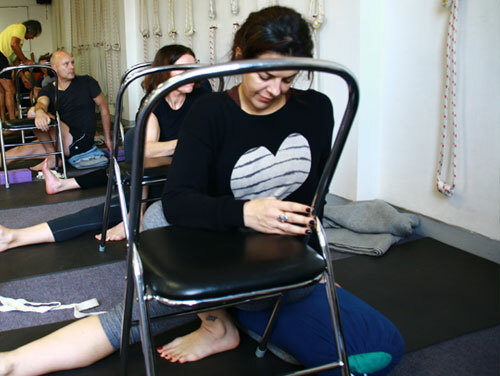 Take advantage of this Level 1 Iyengar Yoga Deal at St Kilda Yoga School, attend any or all of the 25 yoga classes during this 10 week beginners Level 1 course. This deal is not interchangeable with the Level 1 & 2 classes or Beginner classes, however if wanting to join a Level 1&2 class youonly need to pay $5 to attend that class. This yoga deal enables you to attend any of our 5 Level 1 Iyengar yoga classes each week. We have classes available at different times to ensure whatever your schedule you manage to benefit from regular yoga practice. So you don’t fall behind, St Kilda Yoga School recommends that you attend a minimum of 2 -3 classes per week for the duration of the course. In the Level 1 course, instructions are given to our bases to build up the asanas correctly, this helps us energetically, one grounds physically, psychologically and mentally. Leading on from the Beginners course which primarily gives emphasis on foundation and alignment, the Level 1 Iyengar yoga course introduces the next set of asanas that are given to gain more confidence, balance, flexibility, strength, focus and stability. The foundational elements learnt in the Beginners course are the theme that continues through all Iyengar yoga classes. Inversions are taught in Level 1, which are very beneficial for our overall well-being and longevity. The Introductory Pranayamas are introduced to make the student understand how to breathe properly and comfortably. Regular classes at Intro to Level 1 is important as it helps the student to consolidate what has been taught and ensures the proper guidance and understanding through sequences for confidence to practise, and prepare for the next Level 1,2 classes. “I have been going to SKYS since 2009 after a series of chiropractor sessions for my twisted pelvis. I particularly chose Iyengar yoga because of its focus on proper alignment. And I thought doing an active exercise such as yoga would be much better than passive treatment such as chiro adjustments. I found the teachers are very knowledgeable and very passionate about yoga. Founded in 1989, we bring the light into your yoga practice. Centrally located, St Kilda Yoga Studio is easily accessible from all parts of the City of Melbourne. Enjoy a modern, spacious yoga studio with all equipment provided, including mats. Enjoy this Level One Iyengar yoga deal on Acland Street and grab a coffee after on one of the most famous Melbourne coffee streets. If you are unsure if the Iyengar Yoga Level 1 course is right for you, why not come along for a casual class before committing to the 5 Week Level 1 Course. Casual classes are $20. Join us for this special introductory offer and enhance your wellbeing today! For any enquiries, please email or ring the school 0470 361 421. Alternatively, you can also contact Simon on 0431 949 122.